Fueled with hefty slices of yesterday’s poteca, it was on to Croatia and Istria’s alluring stone hilltown, Groznjan (remember those silent j’s!). My favorite draw was the expansive terrace overlooking the Mirna Valley and sparkling Adriatic, but tourists seemed to favor the warrens of craft shops and art galleries. I assumed the tourist mantle myself at Sandra Zagante’s truffle shop, one of several in the town, buying up carry-on-allowable vials of fungi-infused edibles. Stopping there was not accidental; Andrew had booked her as tomorrow’s truffle-hunt guide. But first, tonight’s traditional Istrian dinner of sour cabbage and bean soup, and fuzi pasta with its ox-meat braise. All delectable remnants of the region’s centuries of Austrian rule, for which I say a hearty: Danke schon! And many thanks to Sandra for that next day’s truffle hunt, a new, though somewhat damp, experience for me. Deep-forest trekking not being one of my obsessions, I was grateful for her loan of rubber boots and padded windbreaker. I was obsessed, however, when her two trained dogs scented truffle with ebullient pawing and sniffing, and she dug to unearth a black golf-ball-sized sample. We’d later shave it onto her hearth-warmed farmhouse-kitchen’s lunch of truffle-cream-sauced pasta, the muddy boots and dampness fading to vague memory. 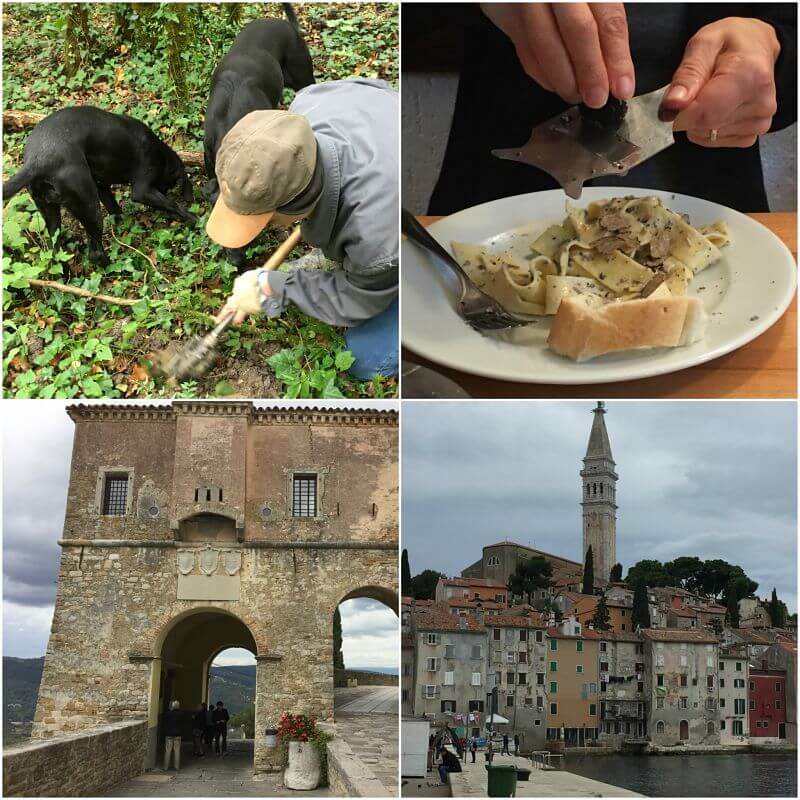 Nothing vague about the post-hunt visit to the five-century Venetian-ruled hill town of Motovun, sated with truffle and craft shops and infinite valley views. Afterwards, the fantasy enchantment of Rovinj, where we roamed serpentine alleys and sipped espresso from a rampart terrace perch, the Adriatic roiling below. For dinner: my prior blog post mention of Balkan cevapcici sausage with its roasted pepper dipping sauce. Tomorrow, back to Slovenia for wine region tutorials.